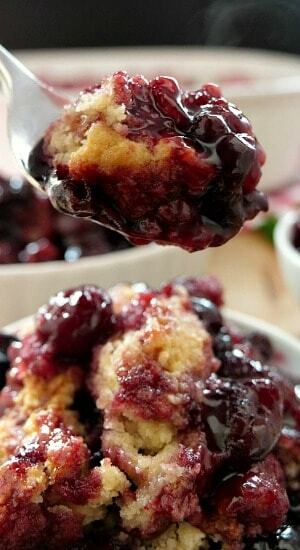 A perfect summer dessert recipe, this easy cherry cobbler is loaded with the flavor of both tart and sweet cherries. 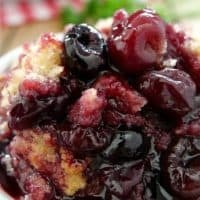 I usually use fresh cherries, but it’s not cherry season yet so the next best thing is using frozen cherries and still being able to enjoy this delicious cherry cobbler anytime of the year. 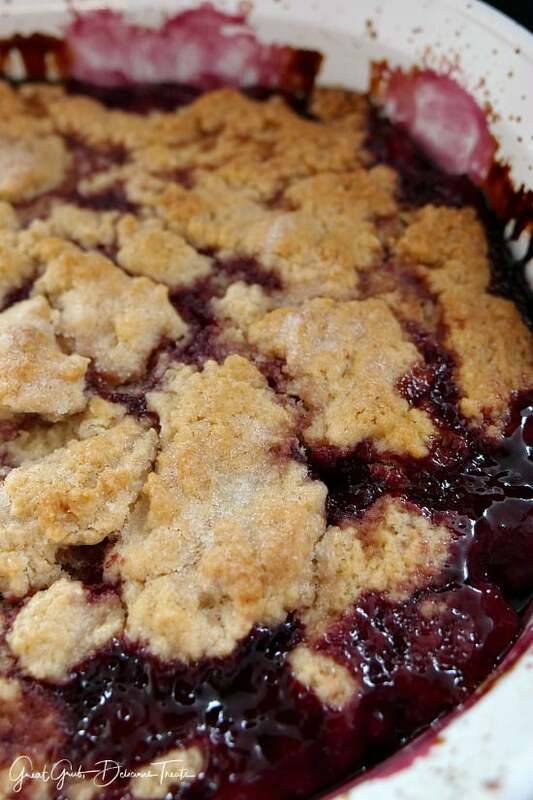 As this cherry cobbler is baking, the smell is heavenly. 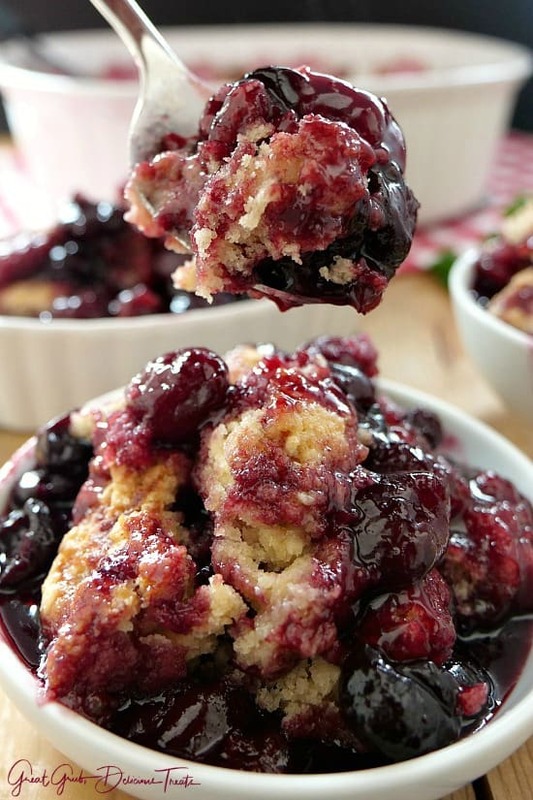 And when it’s done baking and removed from the oven, the cherries are bursting with deliciousness, the filling is bubbly and the cobbler topping is crunchy with tiny bits of sugar glistening on top. Oh yum! 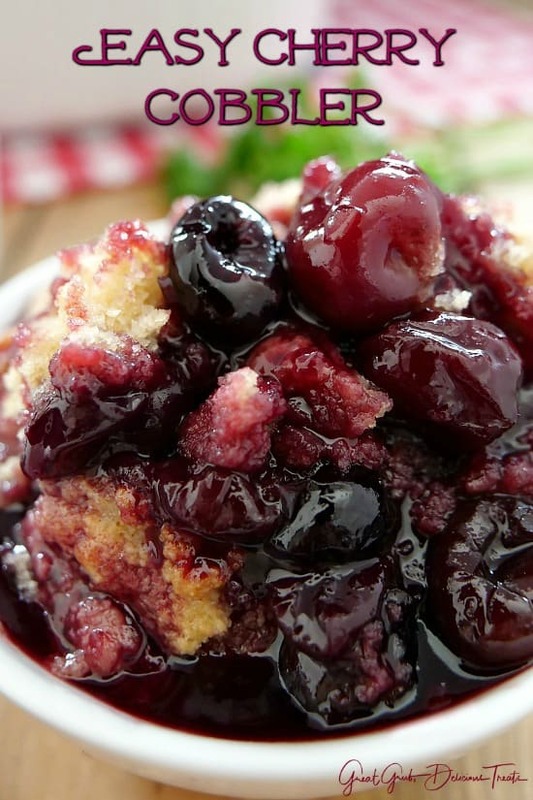 If you are using frozen cherries, remove 6 cups, give a quick rinse with cold water, and add them to a large mixing bowl to defrost or if using fresh cherries, rinse, remove pits and place in a large bowl. Once cherries are almost defrosted, add both sugars, lemon juice and corn starch. Stir and let sit for a few, then stir again and pour into the prepared baking dish. For the topping, whisk flour, sugars, baking powder and salt together, then add butter, mix until crumbly, add boiling water and stir until the mixture is well combined. Next, just spoon the topping onto the cherry filling and pop in the oven. 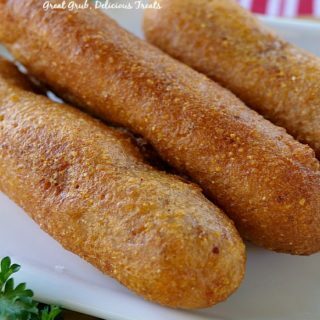 Bake for 50 minutes or until topping is golden brown and cooked thoroughly. 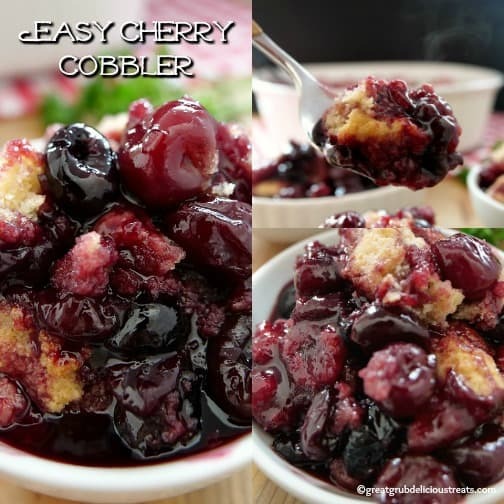 That’s it – Easy Cherry Cobbler! And remember to add a scoop of vanilla ice cream on top for additional deliciousness. Enjoy! 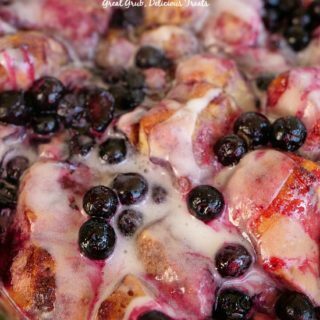 Here are a few more delicious cobbler recipes you can find on the blog: Fresh Peach Cobbler, Caramel Apple Pecan Cobbler, Blueberry Cobbler, Peach Blackberry Cobbler, plus many more. Also, there are delicious fruit crisp recipes as well. Check those out as well. Preheat oven to 375° and spray a 2-3 quart baking dish with a non stick spray. Set aside. 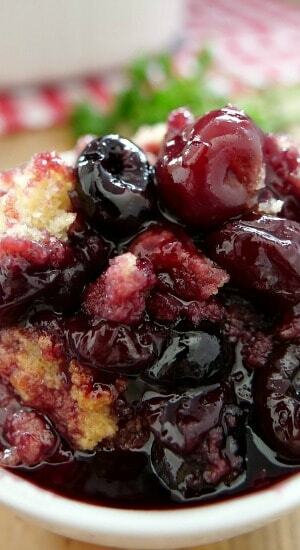 Add cherries to a large mixing bowl. 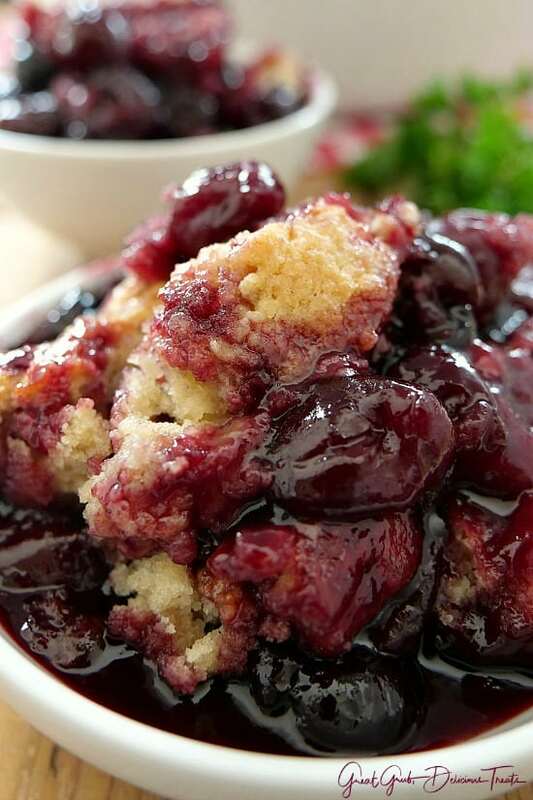 Sprinkle sugar, brown sugar, lemon juice and corn starch over cherries, gently stir. Let stir for 5 minutes then stir again. Pour cherries into prepared baking dish. Set aside. In a medium mixing bowl, whisk flour, sugar, brown sugar, baking powder and salt together. 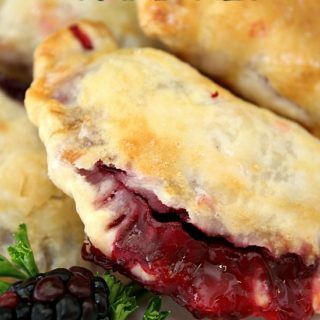 Using a pastry blender, or a fork, mix butter into flour mixture until crumbly. Spoon mixture over cherries and spread gently making sure to cover the cherries completely. Sprinkle additional sugar on top of batter. Bake uncovered for 50 minutes or until topping is cooked thoroughly and has started to brown. 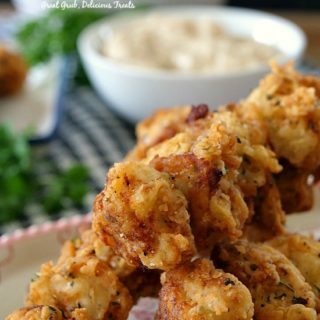 Everything looks delicious. 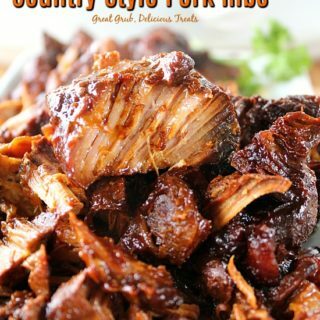 .I can’t wait to try these recipes..thank you! What type of cherries? PIe cherries or bing cherries? 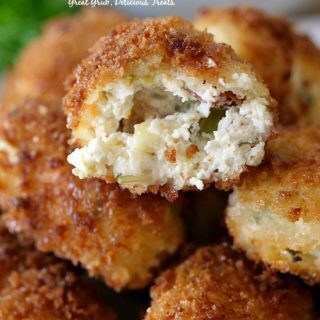 Looks great and no cake mix. Would lit work with rasberries? Hi Melodie, yes it sure will. Most all different fruits will work. Enjoy!